Article 39-A of the Constitution implies duty on the state provide free and competent legal services to the weaker sections of the society with a view to ensure that opportunities for securing justice are not denied to any citizen by reason of economic or any other disability. The legal services authority act, 1987 came into force throughout the country with effect from 9th November 1995. Thereafter Punjab government constituted Punjab legal services authority which came into being on 4th October 1996. Honorable Chief Justice of Punjab and Haryana High Court is the Patron-in-chief while honorable Judge is executive chairman of this authority. Judicial officer of the rank of district Judge is a member secretary of the authority. At each district and sub divisional level, district legal services authority as well as sub divisional legal services committee have been constituted. District and Sessions Judge is the chairman of the district legal services authority whereas Additional civil judge (senior division) is the chairman of sub-divisional legal services committee. Punjab legal services authority, Chandigarh provides free legal services to the poor and the weaker sections of society to protect the legal rights. Who are entitled to free legal service ? How can legal services be availed ? 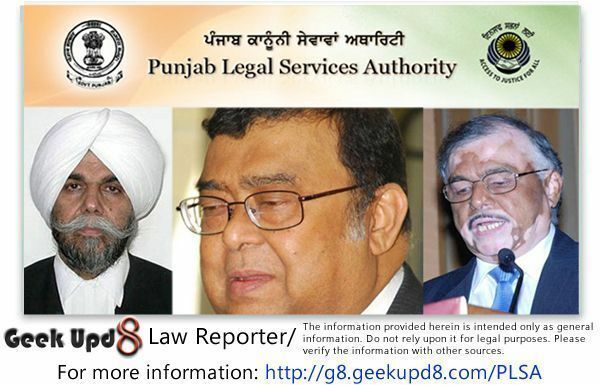 The request for availing legal services in writing or verbally, can be made to the member secretary, Punjab legal services authority, Chandigarh, district and Sessions Judge, civil judge senior division at subdivisional level, Asst district attorney (legal services) or in the front offices, legal aid clinics and legal literacy clubs. In case you are unable to contact your local authorities for getting help for yourself, you can contact us as well, and provide your details, so that we can do the needful and do our best efforts to get you help in availing free legal services.